Exceptional 2-hole capacity with this powerfully designed punch. Easily handles 40 sheets of 20 lb. paper. Durable all-metal construction for years of high-level performance. Chrome handle for added leverage and punching strength. Superior cutting action with patented pin technology - delivers clean and precise 1/4" holes. Fully adjustable paper guide for flexibility. Three stylish woodgrain accents to choose from. Welcome to MyBinding video. 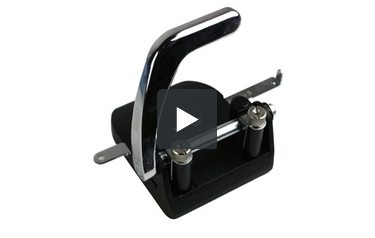 Let's take a look at Swingline's heavy duty two-hole punch. A two-hole punch is pretty straightforward and those that use it, use it all the time. This one has all-metal construction and is built to last. The self-adjust fence allows you to keep things consistent, every punch. It works just as well for both right- and left-handed and can punch up to 40 sheets of 20lb paper in a single punch. And this punch delivers clean and precise quarter-inch holes. And finally, in an effort to keep the office less mundane, there are three wood grain decals that you can choose to decorate according to your office. For more demos, reviews, and how-tos, check out MyBinding.com. What fasteners do the swingline #74060 use? Plesae give reorder number and all relevant information. Thank you. For fasteners for the 2 hole punch, you can use screw posts click here , we have several options to choose from. We also offer 2 different 2 hole binders, Letter Size Green Canvas Post Binders (2-3/4") - 4pk and Globe-Weis 2.5" Kraft Columbia Ring Binder Binding Case - 12pk.